A machine that slashes the overheads required for, and therefore the costs incurred in roadside maintenance, is just one of the many advantages offered by the Cranab Slagcraft unit, a high performing road clearance unit marketed by 600SA, part of the EIE Group. 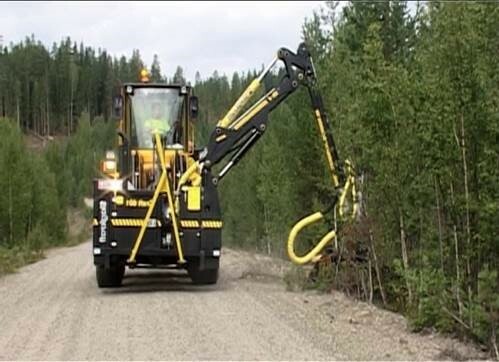 The Cranab Slagcraft machine replaces the tractor and slasher unit and team of brush cutters and chainsaw operators of conventional road clearance methods, requiring significantly less equipment and fewer staff to brush cut the roadsides at a much larger scale. The simple, robust design of the Cranab Slagcraft unit is supported by high quality components for exceptional operational reliability, while few service points means ease of maintenance. In addition, as opposed to the conventional tractor method, which drives next to the road and is subjected to bad terrain resulting in breakdowns, the Cranab Slagcraft unit drives on the road to enable it to operate at a faster speed and to reduce downtime. The flexibility and manouevrability of the unit further enhance productivity, with the head of the unit attached to a crane, enabling working on terrains at obtuse angles that would be highly challenging using conventional methods. The location of the cutting head also means high workplace visibility, while the entire machine is manoeuvred smoothly by joystick, with a door microswitch to ensure operator safety. These environmentally and user-friendly systems bring the world-class operating characteristics of a best-in-class brand to grass and bush cutting, and ultimately to improved road safety.